Stopping school violence, one campaign at a time. 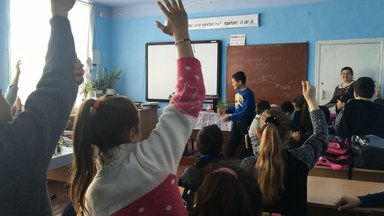 When I first started my Peace Corps Moldova journey back in June 2017, one thing I kept hearing was that you will have many difficult days, many great days, and few days where you feel truly successful. Now I can safely say, I feel truly successful. Gina's partners, Ana and Maria, working on the lesson plans for the campaign. 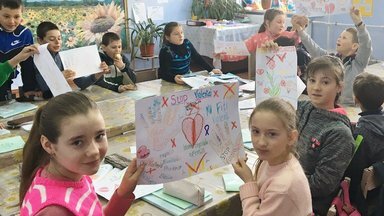 Being a health education volunteer in Moldova, we are expected to work with our partners to conduct several health campaigns throughout the school year. At the start of my service, I was asked to help the existing health club at my school. I was nervous to start work on a club so early in my service, but seeing the enthusiasm from my students made me realize I couldn't say no. The club was made up of students from grades 7 and 8 and together in our first semester, we completed two small campaigns: one on the importance of hand washing and the other on the importance of being happy and having good self-esteem. The campaigns were very passive and I wasn’t quite sure how to advance them or how to encourage my students and colleagues to get more invested. Maria explaining more in depth to the Middle School homeroom teachers about the activities in the lesson plan. The spring 2018 semester was different. Once January came, my health club leaders and I sent out surveys to the students asking the following question: “What is a health problem in our school?” I was not surprised when most of the surveys came back with the answer: Violence. I have personally witnessed both emotional and physical violence in our school between students; however, the fact that the students realized it was a problem made me hopeful. Then, the work truly began. 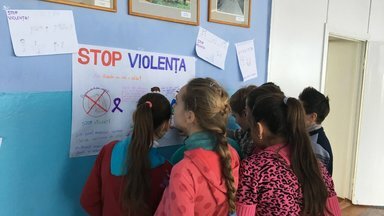 Together with two of my partner teachers, Ana Florea and Maria Ureche, we formulated lesson plans for each grade level to give to the homeroom teachers so they could teach their own classes about violence. Each lesson talked about what violence looks like, how violence affects people and more importantly, how to stop it. Additionally, my health club created informational posters around the school and purple ribbons for every student. Fast forward to February 2018, my partners and I held a meeting with all 21 teachers in our school and discussed violence in the school, at home, and in the world. We gave them all lesson plans tailored for their students and materials that they would need for the lesson (puzzles, blank paper for posters, etc.) and got their input on the subject. Although I was nervous, the meeting went well and my colleagues had an understanding of the campaign topic and the goal of the campaign. But the part that mattered most in this whole process was if they would teach the lesson and the if students would understand the topic and the issue. Students reading an informational poster made by our Health Club. Throughout the campaign week, I attended several of the lessons on Stopping Violence and saw my students both active and engaged. I even had students want to take pictures with facts about violence. Every teacher put in a lot of effort into teaching this subject, and ultimately, my school came together. I actually cried on one of the last days of the campaign (happy tears, of course) watching the 3rd-grade class. 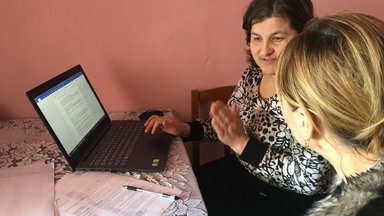 Not only did the my third partner, Elena Tacu, teach the lesson, but she also had students fill out a survey beforehand, invited parents to observe the lesson, created new activities for the topic, and held a private meeting after to discuss how parents can help. She engaged the students and made them feel like a team against violence and discussed with them how to handle anger and help other kids who experience bullying. I was blown away. I later discovered most of the primary school teachers had done the same thing and worked extremely hard to make this campaign successful and beneficial for our entire community. Students in 6th grade actively participating in the lesson on violence. I didn’t know if there would be a positive long-term effect or not in the weeks that followed, but this week, this week made a difference and that is a success. I cannot thank my colleagues enough. Without them, this campaign would have just been a few posters on the wall and some forgotten purple ribbons. I am fortunate to have an amazing community and an amazing school. As winter comes to a close- I look forward to finishing my service in my village and continuing to work side-by-side with my counterparts. Gina is originally from Southern California, she graduated with a B.S in Public Health and a minor in Education from the University of Massachusetts Amherst. 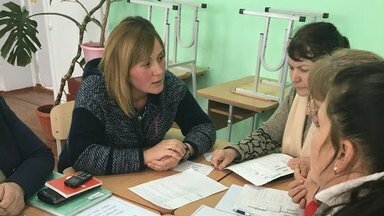 She is currently serving in the Republic of Moldova as a Health Education Volunteer where she co-teaches with 3 host country nationals covering a wide range of topics about physical, mental, and social health.